This week one of Canada’s most well established and highly reputed dance companies will grace the stage of the Théâtre Raymond Kabbaz in Los Angeles with two evenings (October 6th and 7th) of works that convey a unique spirit of dance in our times. The multiple choreographers of Les Ballets Jazz de Montréal bring national and cultural diversity along with a wide spectrum of styles ranging from neo-classical ballet to urban street dance. Other arts such as theatre as well as folk and jazz music also influence the dance forms. The technical training of the dancers is evident in every move, and their seemingly effortless polished performance is not to be missed. Cayetano Soto from Spain offers the visceral energy of a duet in the compact Zero In On to the music of Philip Glass. The exceptional pliability of the dancers fills the spotlight. In Night Box, Wen Wei Wang rotates the sizes of the dance groups as sequences shift with the vibrant rhythms of the city after dark. Emerging from the black of night is a rapturous pas de deux for two men, revealing a compelling dynamic between private and public spaces in everyday life. 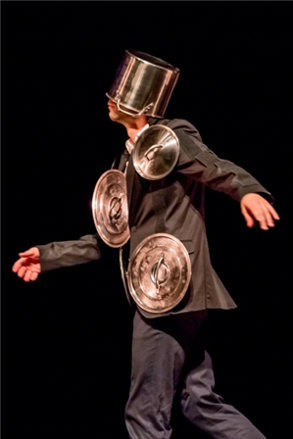 Harry allows Los Angeles-based Barak Marshall, who also leads a dance company in Tel Aviv, to explore the ways that dance employs theatre as an expressive mode while it takes up history, ethnicity, and identity. Harry makes use of American jazz music and expresses a variety of colors. Benjamin Millepied choreographed his pas de deux Closer to the music of Philip Glass’s “Mad Rush” but drew on classical ballet. We feel the delicate and intricate tension between the two as the dancers move so fluidly, entwined mellifluously in each other’s bodies, they appear to be skating or floating across the stage. 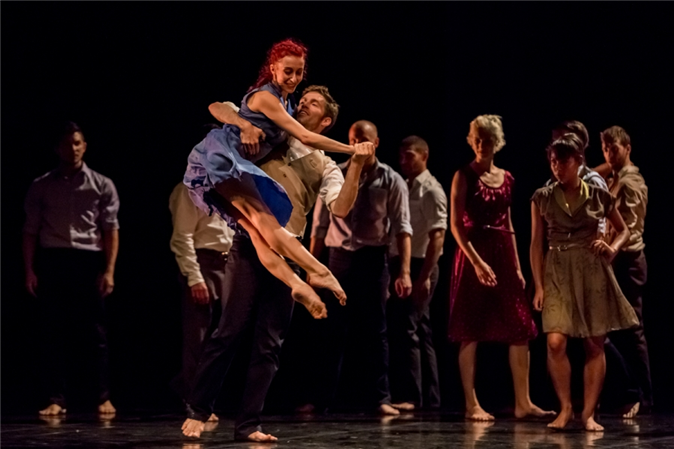 Recent appearances of Les Ballets Jazz de Montréal in Cleveland and Beverly Hills included the entire company of dancers and staged performances of the complete works offered at the Théâtre Raymond Kabbaz. The 75-minute program in Los Angeles on October 7th and 8th was created especially for the TRK and its mid-size, 220-seat theatre. The opening and closing works, Zero In On and Closer, will be performed in their entirety at the TRK. Night Box will show 22 minutes of its total 35-minute full ballet, and Harry will offer 18 minutes of the full 40-minute ballet. These excerpts will also be staged differently from the ways they were presented in full-form. In preparation for this complex mélange of dance forms, I interviewed Louis Robitaille, who has served as the Artistic Director of Les Ballets Jazz de Montréal since 1998. Since the genesis of the company in 1972, it has emerged as one of the most widely touted purveyors of ballet for our era, and Louis Robitaille has carried forward its eclectic spirit and its collaboration with some of the most prestigious artists in the dance world today. KINOCaviar How do the identities of the individual dancers distinguish the style of Les Ballets Jazz de Montréal as a dance company? Louis Robitaille When our company got started 44 years ago, it was a jazz dance company, and now we do contemporary ballet. We’re the second-oldest dance company in Montreal, and are now regarded as an institution in Canada and as one of the senior dance companies in North America. All of our choreography requires classical ballet training, and we mix it with other dance forms and other arts as well and training in other areas, too. We like to explore. We are first of all a “Creation dance company” — we respect the individual identities of our dancers, but as in life itself, we like to go further. We need to be really strong technically, and versatile because we’re so eclectic; we use the different personalities and styles of our dancers. We’re a kind of mirror of what’s going on in the dance world at this moment. KC Can you elaborate on the ways in which you, as Artistic Director of the BJM, have developed a “research laboratory” through “creative residences”? How does this work? For example, how are notions of “openness” and “community” reconciled with each other in the context of the dance company? LR Before we start a creation, when we have an idea of what we want to develop and which creator we want to work with, we schedule a couple of days with the creator, the artists, and the collaborators in a workshop with no established purpose in mind, but just to meet, to generate an intimacy, to build the trust we need to work with each other. When everything comes together, we give the green light and go ahead. KC How is it that BJM came to be regarded as a “feel-good company”? LR It’s more about the atmosphere, the emotions, the feelings of the evening. Dance can be very dramatic, very dark, but also bright, joyful, beautiful. We care about the energy of the evening, the physical and athletic dimensions of the dance. Our work is very accessible. Its messages can be interpreted in various ways, with layers of meaning. Whether you have knowledge of dance and experience with it or you’ve never been exposed to it before, you can still enjoy the performance. Democratizing is one of the qualities of our company. Dance, when it’s done well and presented well, can be for everyone. KC Can you comment on the ways in which the program and its presentation in Los Angeles will vary from earlier performances of the same works? LR In L.A., we’re working with the concept of “Dance Two,” which we started last year when we performed in a church in Montreal. The idea was to create dance in a duet for the whole show, so there would be less dancers. We’ll be a small group here. Everything will need to be adapted. We’ll perform separate pieces non-stop from beginning to end with no intermission. Background projections will be used twice as transitions between the dances. Working with a smaller stage and theater, the concept is to focus on solos, duets, trios, and quartets. For example, Night Box as a full ballet uses three big-group sequences; tomorrow there will be only one big group on stage in this dance. In the larger production it’s designed with incessant blinking lights and baths of light that emerge from the dark backdrop. Here the lighting will be adapted for the smaller production. Another example is Harry, which requires a big space for the full-scale production. On the smaller stage at TRK, the performance will be less theatrical and more dance-oriented. The concept of including drama in the complete ballet means that the choreography includes talking, but there will be very little talking in this version. KC How many dancers from the company have come to Los Angeles to perform at the TRK? LR We’re often on the big stage with a different concept of production for a different communication with the audience. In Cleveland there were 15 dancers; here there are 9 of us. Twice during the evening, all 9 dancers will appear on the stage at once. In this smaller production everything is focused on the dancers and the choreography —highlighting the artists and the dance itself — to generate a more intimate experience. KC Well, welcome to Los Angeles, and good luck with the performances! LR Thank you, and enjoy the show! Dancers: Céline Cassone, Mark Francis Caserta, Morgane Le Tiec, Daniel Alwell, Kiera Hill, Guillaume Michaud, Jeremy Coachman, Alexander Hille, Ashley Werhun. Assistant to Choreographer: Laura Fernandez Castillo (Zero In On), Inbar Nemerovsky and Osnat Kelner (Harry); Lighting Design: Cayetano Soto (Zero In On), Roderick Stewart Murray (Closer), James Proudfoot (Night Box); Lighting Production: Daniel Ranger; Costumes: UNTTLD, Simon Bélanger, José Manuel St. Jacques (Closer, Night Box), Cayetano Soto (Zero In On), Anne-Marie Veevaete (Harry), Annabelle Lopez Ochoa (La Pluie).